SeriesMappingItemsSource feature is new* to* Q1 2011. It will be helpful for those who want to use declarative binding and is much more MVVM friendly. 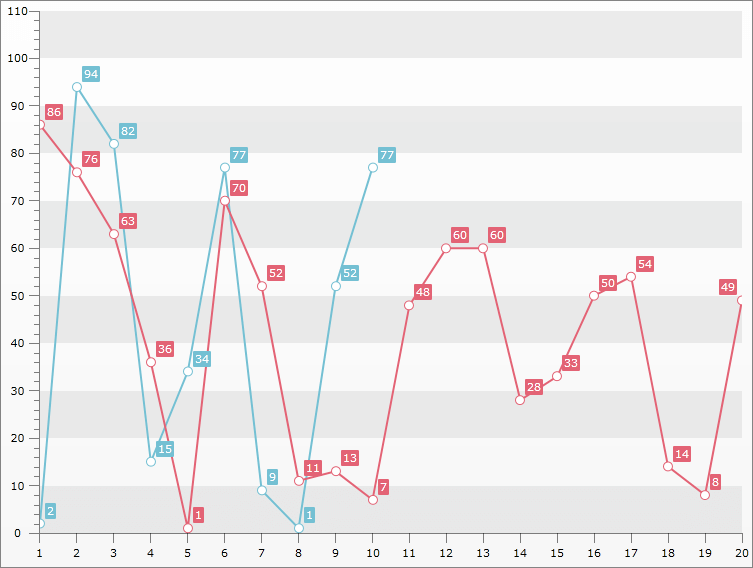 It also allows the RadChart's Series to have different number of datapoints. 2 . Create a new class named MyViewModel, which implements the ViewModelBase interface. It's property Data will be used as ItemsSource for the Chart (to bind the First Line using Manual Series Mapping approach) and the MappingData will be ItemsSource for the second Line. 3 . Add new RadChart declaration. The key here is to disable the Default Layout of the RadChart and manually set the two SeriesMappings in common ChartArea - done with providing same name to the Chart Area with "ChartAreaName" property. Otherwise the "No Data Series" default message will appear over the two Line Series.